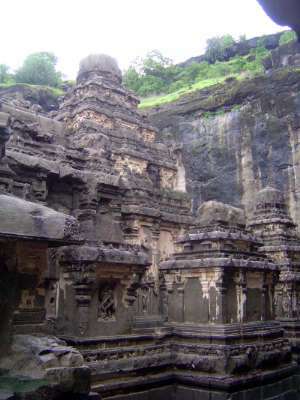 Europeans have visited Ellora since at least the time of Niccolao Manucci, a Venetian whose history of the Mughuls dates from about 1700. The site must have perplexed him, because he sought to explain it by appealing to visitors from China. "Signs of the presence of the Chinese are not wanting in Hindustan. 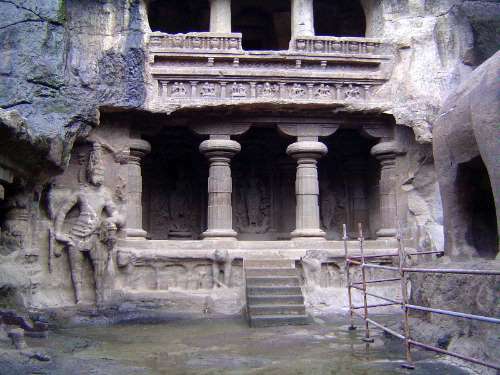 These are found chiefly in the country of the Dacan, where there is a hill called Alura... [with] several caves dug out by pickaxes, forming lovely open courts, halls, rooms,[and] cells having corner-stones ornamented with various Chinese figures... As they are so cleverly done, and their appearance somewhat Chinese, many say that they were executed by the ancient Chinese." 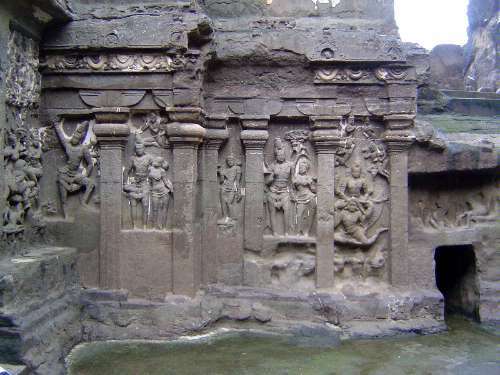 The explanation is not quite so bizarre as it sounds, because some of the caves are Buddhist and carry images similar to many found in China. Fergusson knew better. 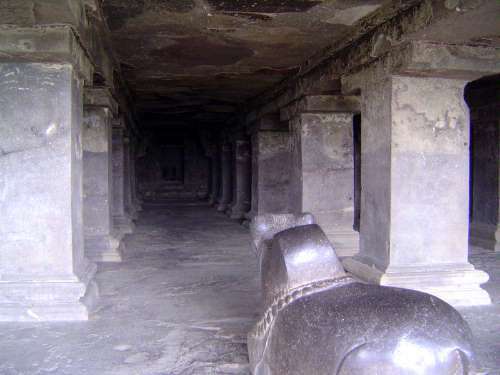 On Ellora, however, he was also a bit of a killjoy. 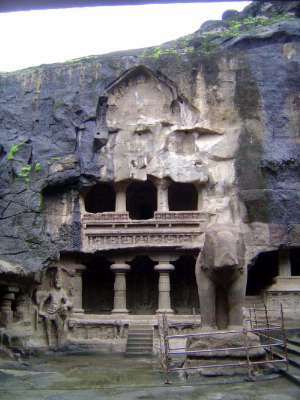 Writing of the most famous cave, known as Cave 16 or Kailash (or Kailas, as he spells it), Fergusson admitted that it was "in itself one of the most singular and interesting monuments of architectural art in India... it is better known than almost any other structure in that country." 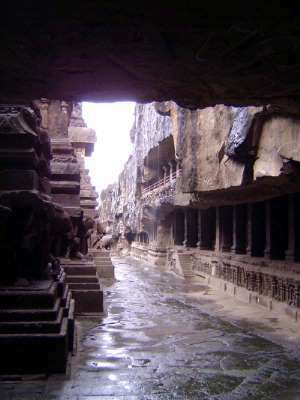 He explained that the temple had been carved into the side of a ridge by creating a hole 106 feet deep, 160 wide, and 280 long. 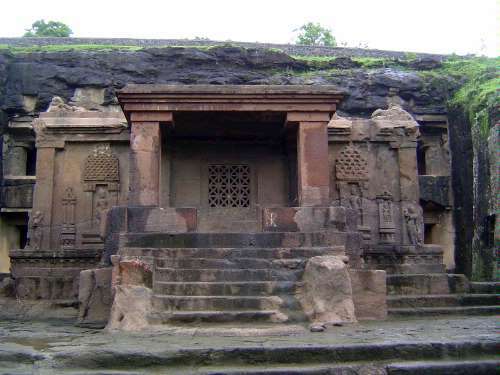 The temple, left as a residual monolith, was 96 feet high. 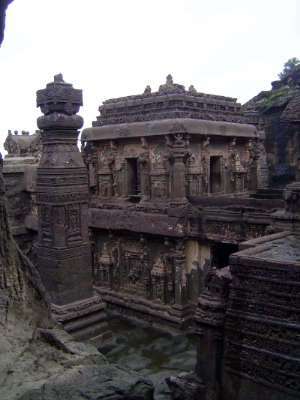 And here comes Fergusson's cold water: "...had the Kailas been an edifice of masonry situated on the plain, it would scarcely have attracted the attention of European travellers." 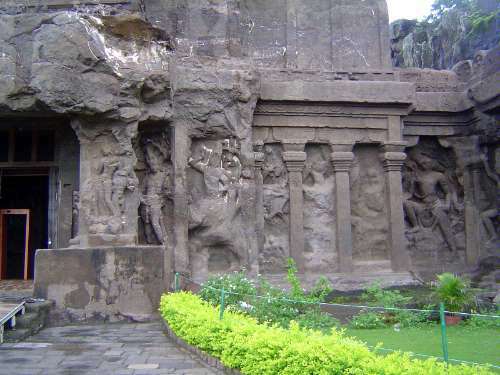 It was its method of construction that fascinated visitors, but Fergusson points that that "it is considerably easier and less expensive to excavate a temple than to build one." It was easier, in other words, to chip away and haul off 400,000 tons of waste rock than "to quarry so much, move it, and raise and set it." He insisted that the "excavating process would cost a tenth" as much (i. 349). 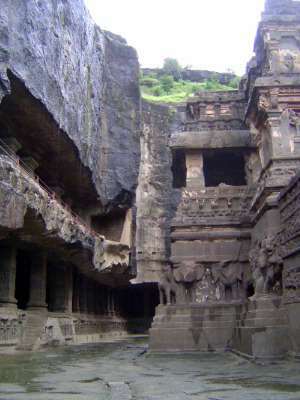 Here you can visualize the dimensions of the cutaway material, though the entrance blocks site of the temple within--and all but the spherical peak of the temple. Seely sounds like one of the many seekers who have fallen in love with India. He writes (p. 143): "Much precious time have I, in the zeal and enthusiasm of my youth, wasted on Hindoo mytholody, and legendary lore, and at last rose up as satisfied, and about as much instructed in the early period of Hindoo history, as at my commencement. Truly, with the greatest application on the spot, and with native assistants, it is an endless and unprofitable task: I literally, from intense study, assuming the dress of a native, living on a vegetable diet, with pure water for my beverage, was almost mythologically mad, for upwards of a year...."
Seeley contrasts India with Europe: "While every part of Europe is ransacked and tortured, and every old stone wall and mutilated statue is honoured with half a dozen distinct histories, the vast continent of Asia remains a terra incognita" (p. 184). 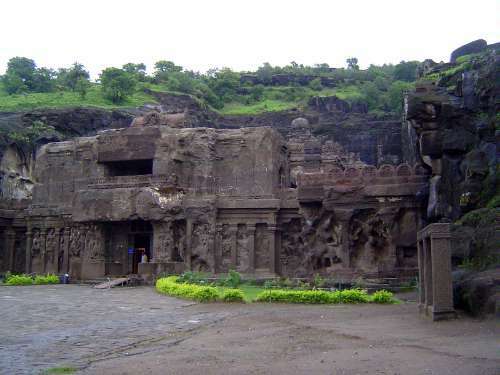 Crowds now congregate at Ellora, however, so we'd better go inside before the tour buses arrive. 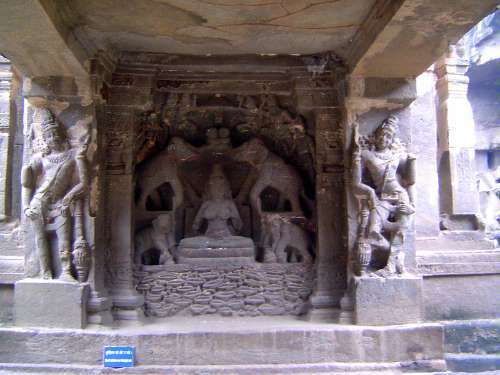 At the entrance, Gajalakshmi, which is to say, Lakshmi with elephants. We'll make a clockwise circumambulation starting here, just after six o'clock. 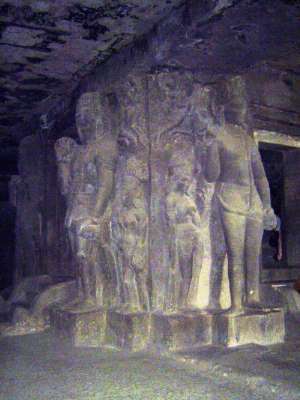 The obelisk is one of a symmetrical pair, formerly topped with the tridents of Shiva. A side chapel near the entrance. 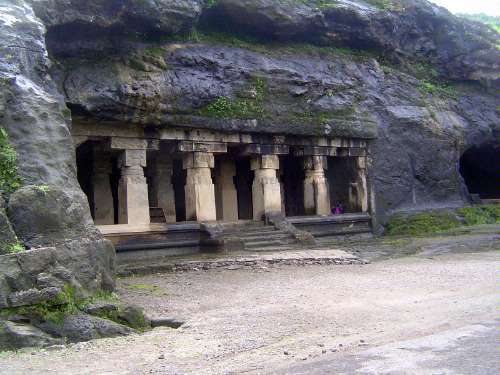 Roger Fry, in The Arts of Painting and Sculpture, writes that "Indian architecture proceeds, not as ours, according to the principles of construction; it is rather conceived of as an object cut out of a solid material as an ivory figure might be." 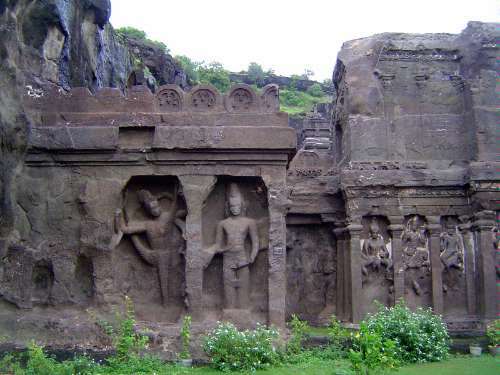 (Quoted in Ramesh Gupte, Ajanta, Ellora and Aurangabad Caves 1962.) Fergusson, always beautifully succinct, put it this way: "The Hindus conceived like giants and executed like jewelers." 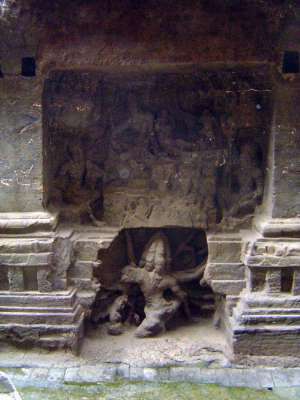 This particular side cave holds a shrine of river goddesses, with images on the rear wall of Sarasvata, Ganga and Yamuna; Ganga can be seen here standing on a makara, a mythologized alligator. Seeley writes (p. 201) that "a powerful, scientific, and generous nation, like the English, ought not to allow any injury to happen to these mighty works, which can, by a very little trouble, and by incurring no expense, be prevented. If we do, we are barbarians, worse than the Mussulmans." Not bad for 1825, especially if we imagine that the British empire was run by arrogant bigots. 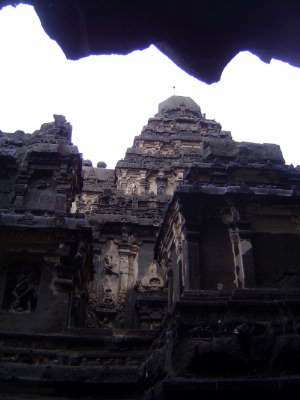 A good view of how the temple, on the right, is the residue left when digging the pit. The process seems to have involved digging three trenches, then working on the edges of all three. And who actually did the work? 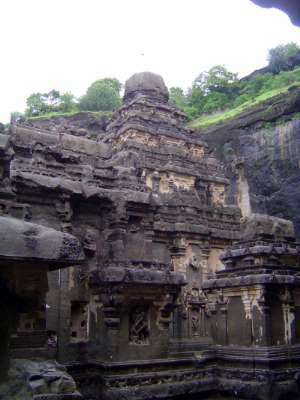 An inscription dating from 812 states that Krsnaraja built "a temple on the hill at Elapura, of wonderful structure...the architect-builder of which, in consequence of the failure of his energy as regards [the construction of] another such work, was himself suddenly struck with astonishment, saying, 'Oh, how was it that I built it!'" 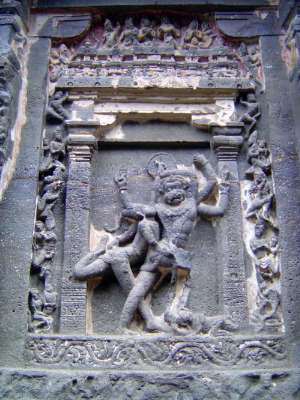 On the side of the temple base, there are figures of Shiva and Vishnu on an anthropomorphic Garuda. Looking back toward the entrance. 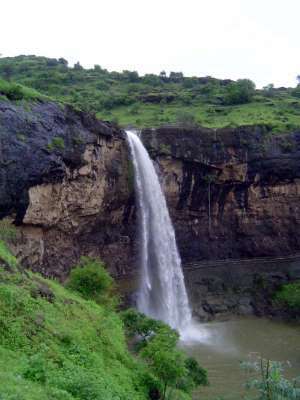 Rainwater is running off the edge of the surrounding cliffs. 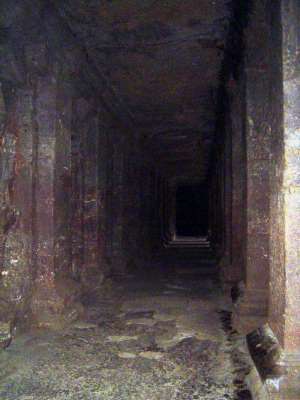 The dark gallery around the back wall. Looks rather bare, but looks can deceive. 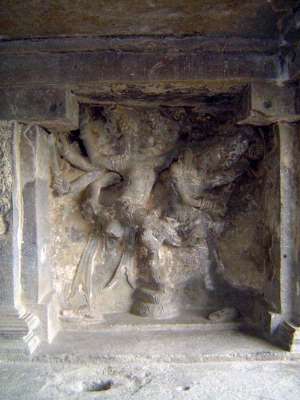 Set into it, a dancing Shiva. 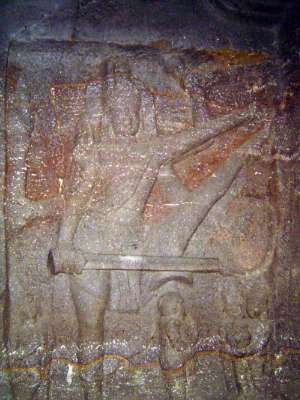 Trivikrama or Tripurantaka. 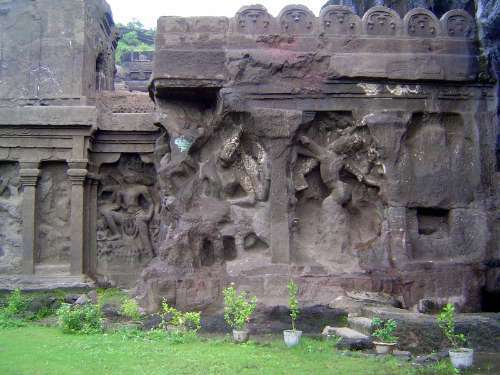 Many variations of this important image occur at Ellora. 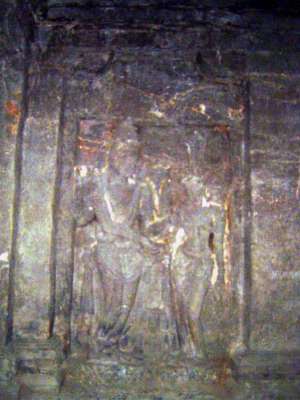 The marriage of Shiva and Parvati. Bright light comes over the temple. 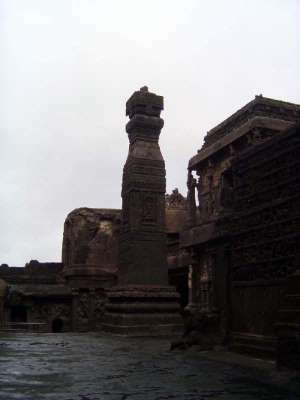 The shikhara or temple spire symbolizes Mt. 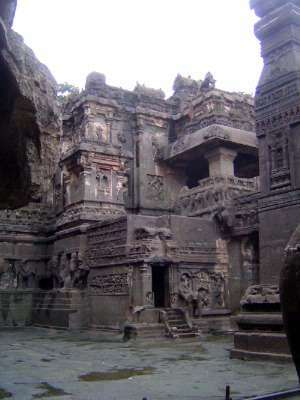 Kailash, Shiva's Tibetan home. A better view of the shikara, or at least a less blindingly bright one. 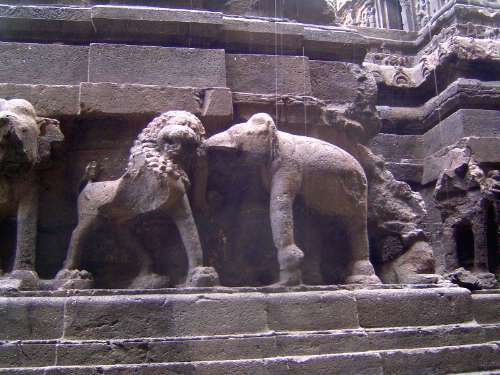 At the base of the temple, elephants fight superscale lions. The lions have the edge. We've come around to five o-clock and the matching column or dhwaja-stambha, literally a flag pole. 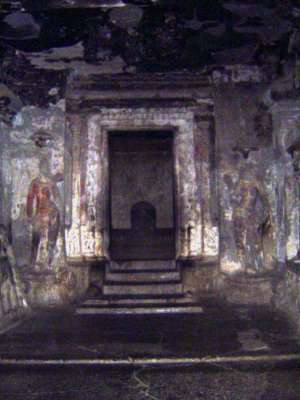 The small room on the upper level contains a figure of Nandi, Shiva's mount, who faces the sanctum, off to the right. 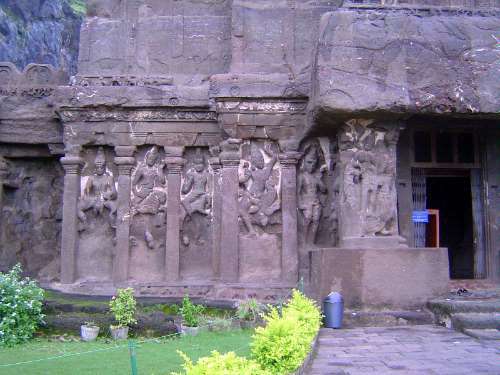 The base of the temple on this side contains several dramatic images. 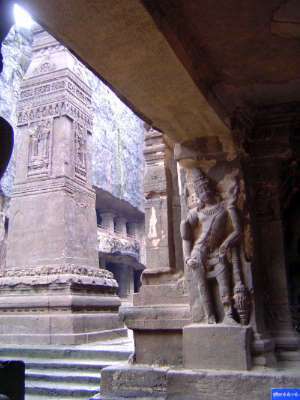 Here, Narasimha (Vishnu's fourth or lion incarnation) fights to free the world of the demon king Hiranyakashipu. It's hardly a contest. The traces of plaster are a reminder of the temple's original coating of stucco and white paint, detailed in red, blue, and yellow. 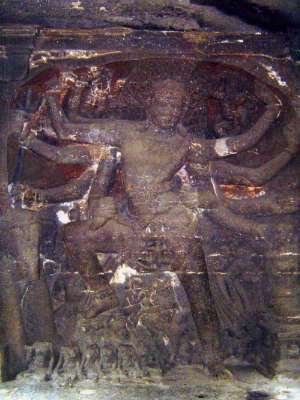 Andhakasura-vadha-murti Shiva, or Shiva as Bhairava. 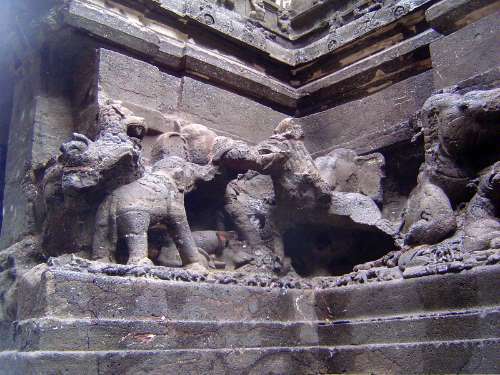 This is a violent form of the god, who here destroys evil, which is represented by the elephant demon; at the same time he caresses Parvati. His ten hands show his power; with one, he uses an elephant skin to destroy the demon by depriving him of the sun's rays. 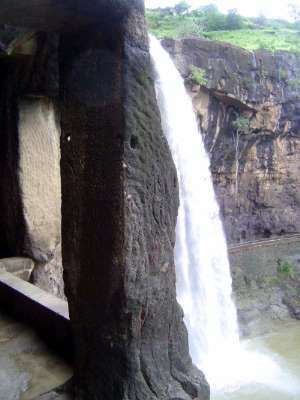 Mahayogi Shiva. 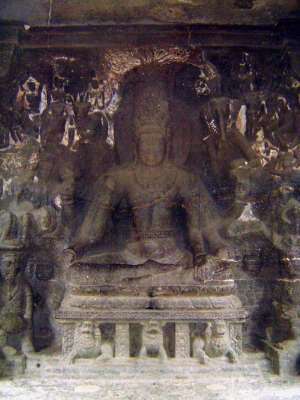 The god sits on a lotus platform in meditation. 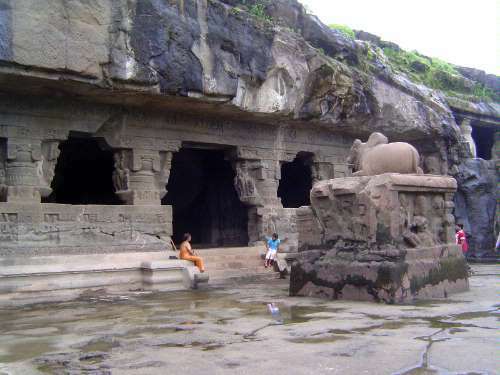 To his side, sadhus meditate and musicians play but do not disturb Shiva. 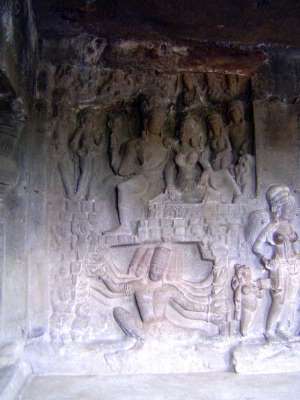 The demon Ravana shakes Kailas. 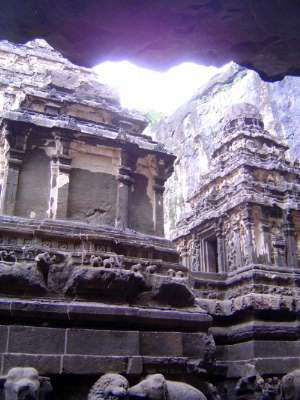 Approaching the sanctum, on the second level; Nandi is behind the camera. 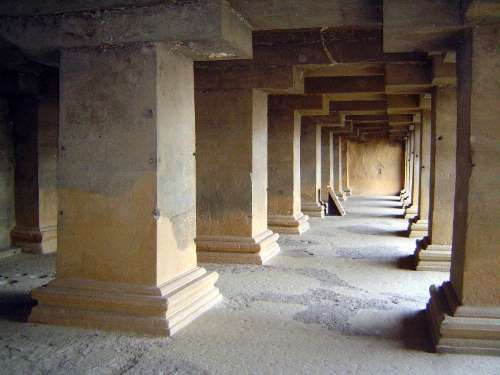 The doorway leads to a hypostyle hall, its 16 columns supporting the immense weight of the stone above. Remember that this, too, is all the result of excavating the rock from around these pillars, not moving the pillars into place or assembling them here. 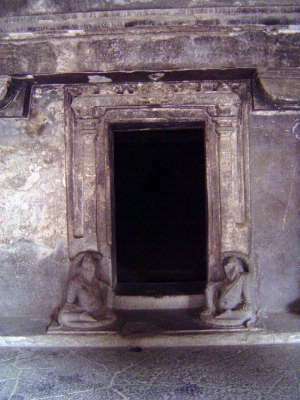 The sanctum, guarded by Ganga and Yamuna. Inside there is only a simple lingam. 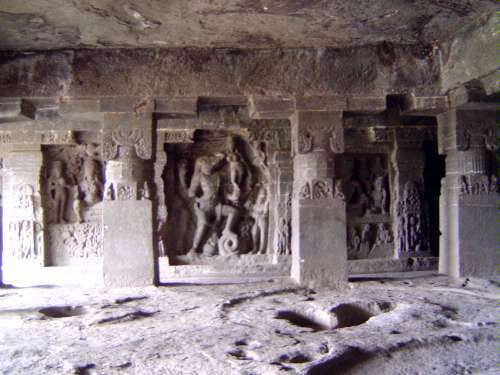 We're going to take quick look at some neighboring caves, neither as spectacular as Kailash but with expressive sculpture. 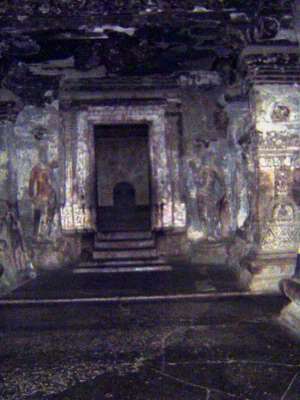 Here, the entrance to Cave 15. 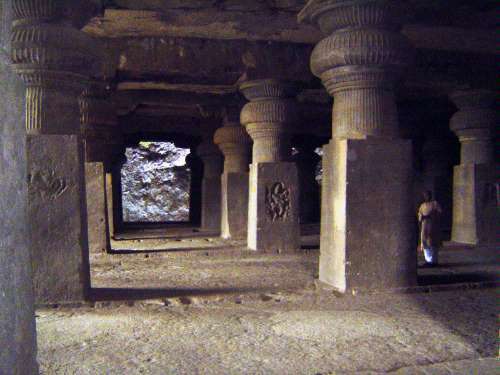 In the back wall, a massive hypostyle hall leads into the excavated cave. Nandi keeps an eye on the sanctum. With blazing speed, Narasimha overwhelms Hiranyakashipu. 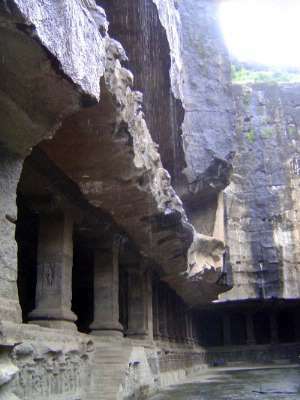 The entrance to Cave 14. 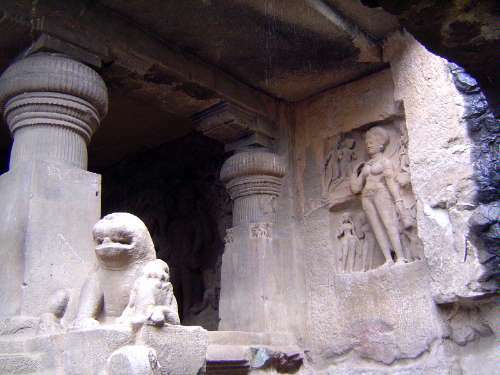 Varaha, the boar avatara, stands with one foot on Shesha, king of the serpents; meanwhile, he holds Prithvi, the Earth goddess. Durga, foot on lion and trident in hand. 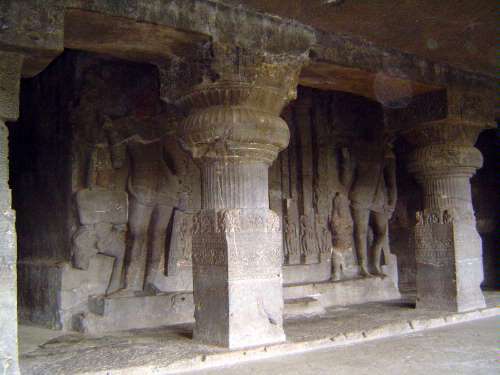 Cave 21, Rameshwar, with intricately carved entrance columns. A mile to the west, there's a waterfall and, to its west, another set of caves. 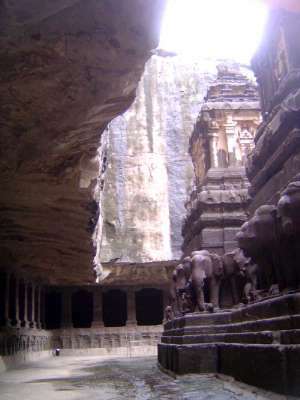 One of those caves opens next to the fall. The same opening, but here looking inside. 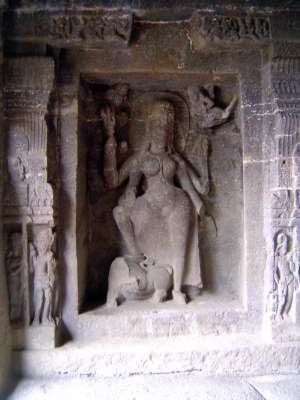 The figure on the wall, if she had been shown with a makara, could be identified as Ganga. As it is, the experts settle on "a goddess." 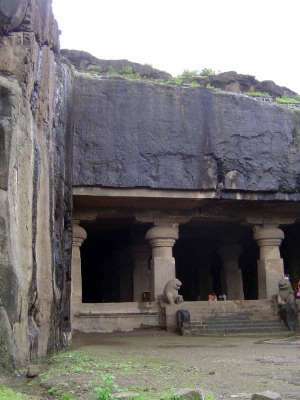 The main entrance to the same cave, Cave 29, called Dumar Lena or Sita ki nahani (Sita's Bath, from the waterfall). 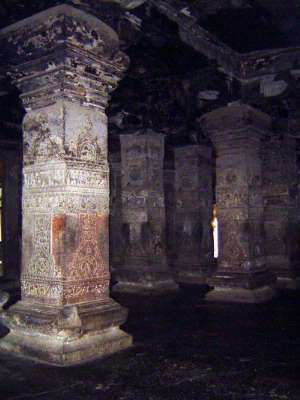 The shrine is square, its corners carved with pairs of guards, dvarapalas, protecting the lingam. 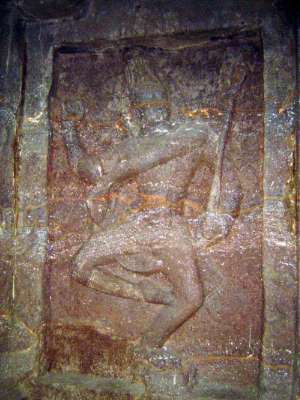 A more interesting--certainly more dramatic--image: Ravana shaking Kailash.